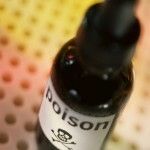 This was a blog I posted on Murderati for my turn at our “Wildcard Tuesday”. Amazon moved into the publishing realm (sort of) in 2009 with AmazonEncore, a program where Amazon selected self-published titles they felt deserved greater attention and marketed them as AmazonEncore editions. In 2010, the imprint moved into a more traditional role, publishing original manuscripts (some selected via the Amazon Breakthrough Novel award and some via agent submissions). Also in 2010 came Amazon Crossing, an imprint that publishes English-language versions of foreign language books. However it was in 2011 that Amazon really launched itself as a publishing ‘house’ (as distinct from its offering to authors who can self-publish on Kindle). Then in May this year, Amazon set up its New York-based imprint, appointing Laurence J Kirshbaum at its helm and focusing on non-fiction and some literary fiction. The imprint made its first acquisition in August, withTimothy Ferriss’ self-help book The Four-Hour Chef (for publication in 2012). Amazon’s most recent foray into publishing came earlier this month, when the company moved into the children’s publishing book market through its purchase of Marshall Cavendish Children’s Books. The trade publishing list includes over 450 children’s books and the deal was made via Larry Kirshbaum’s publishing unit. One can only assume that acquisitions will follow. Certainly there’s no arguing that Amazon has been a powerhouse since it launched amazon.com in 1995. As a retail player, it’s revolutionalised the book buying and selling business and of course Kindle has changed the way we read books — forever. And is it even necessary to mention what Kindle and ebooks have done for an author’s ability to self-publish? What do you think? And will other book retailers following Amazon’s footsteps? 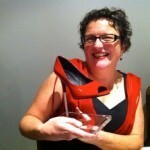 Today I’d like to welcome Aussie author Angela Savage to my blog. 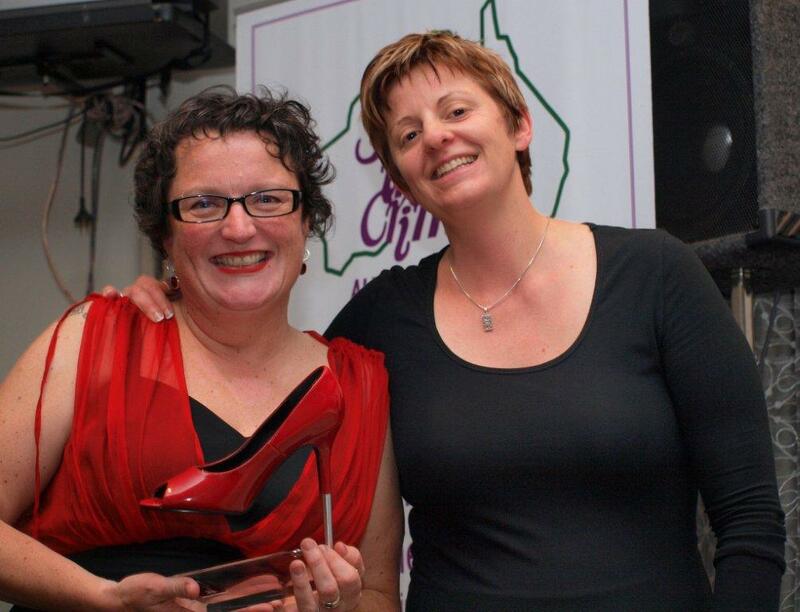 I’ve met Angela a couple of times on the mystery ‘scene’ and ran into her again at Sisters in Crime Australia’s Scarlet Stiletto Awards – Angela won the top honour of the night and I was there as the official presenter. You may also recognise Angela from my ‘photoshoot to kill for’ blog. Given Angela’s first novel was written after an award-winning short story introducing her main protagonist, and that she’s written extremely successfully in both the short and long form, I asked Angela to blog about the short story and the novel. What attracts her to both forms? Does she approach them with a similar mind-set? 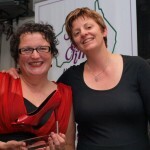 I’ve entered the Sisters in Crime Australia Scarlet Stiletto Awards short story competition twice, once in 1998 and again in 2011. The first time I was an unpublished writer with an abandoned manuscript burning a hole in my filing cabinet. Short story competitions provided me with focus, opportunities to practice my craft and try something new. The Scarlet Stilettos held the particular appeal of being exclusively for women writers, with stories required to have an active woman protagonist. In what was my first foray into crime fiction, I submitted a story called ‘The Mole on the Temple’ about an Australian expatriate detective called Jayne who exposes a card scam in Bangkok. My story won third prize. More valuable than the prize money was the confidence this gave me to persevere with both the crime genre and the main character. 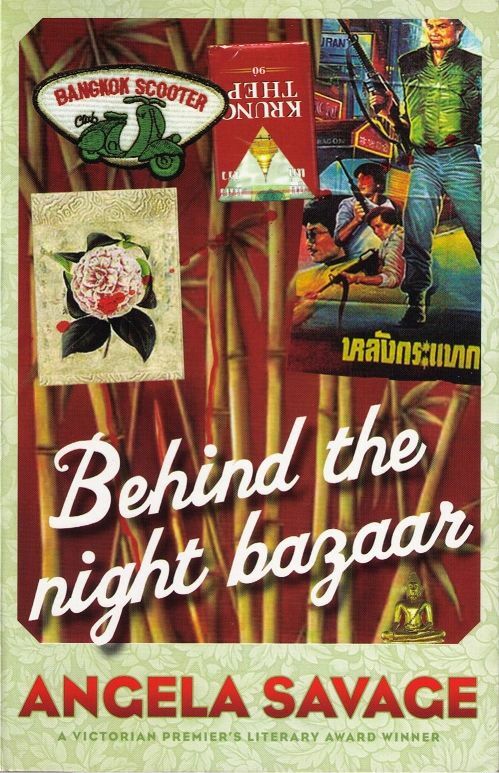 Jayne went on to acquire the surname Keeney and became the hero of my first novel Behind the Night Bazaar published in 2006. The second book in the Jayne Keeney PI series The Half-Child followed in 2010 and I’m currently working on the third, working title The Dying Beach. 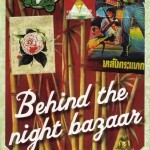 Funnily enough, Behind the Night Bazaar started life as a short story that just kept growing. 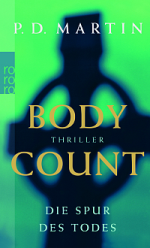 I’ve since ‘cannibalised’—to use Raymond Chandler’s word—several of my early short stories for scenes or subplots in my novels. 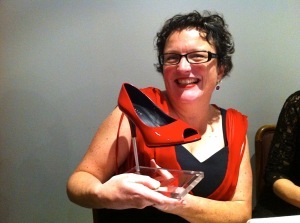 I’m not the only author to have kick-started my writing career with a prize at the Scarlet Stilettos. So far 15 women, including category winners like me, have gone on to publish novels. But I’m the first established novelist in the 18-year history of the Scarlet Stiletto Awards to return to the scene and take home the coveted Scarlet Stiletto trophy. So what made me decide to enter the competition again after a 13-year break? Part of the motivation stems from a crisis I had earlier this year about whether I could call myself an ‘Australian writer’, when everything I’d written was set in Thailand in the 1990s, albeit featuring Australian characters. I challenged myself to set a story closer to home and the result was my winning entry for the 2011 Scarlet Stilettos, ‘The Teardrop Tattoos’ set in contemporary Melbourne. The plot, involving a restricted breed dog, became inadvertently topical when a four-year-old-girl was tragically killed in an attack by a pit bull terrier only weeks after I submitted the story to the competition. As in 1998, the short story form gave me an opportunity to try something new. But this time around I have no desire to develop the characters or plots into a full-length novel. 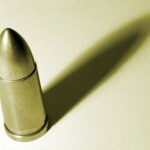 Pound for pound, I find short stories harder and more time consuming to write than novels. 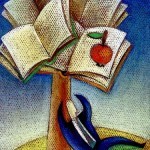 Short stories and novels have different centres of gravity. Both need to hook readers in at the start, but the narratives have different arcs. Short stories are less forgiving. There’s no room for superfluous adjectives or adverbs. With novels you can loiter a little, while the nuances of the story and characters play out. Short stories have to maintain the pace or they’re dead in the water. Secretly, like an actor who longs to direct, I’d really like to write songs—to tell a whole story in three or four verses and a haunting refrain. I’ll just have to keep practising. Angela’s first book, Behind the Night Bazaar, won the Victorian Premier’s Literary Award as an unpublished manuscript in 2004 and was shortlisted for the Ned Kelly Award for Best First Book in 2007. Her second novel, The Half-Child was shortlisted for the Ned Kelly in 2011 for Best Fiction. The Half-Child is available in Kindle version on Amazon or in hard copy through Text Publishing. 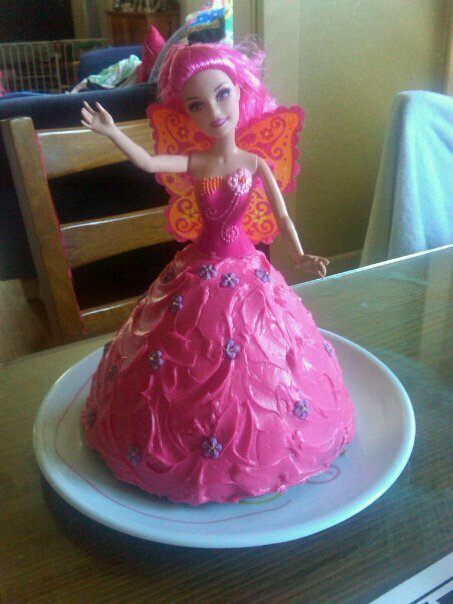 Yesterday was my daugther’s 5th birthday. We have a tradition in our family of celebrating birthdays for many days…and her 5th is no exception. So we started off on Sunday with my family coming over to celebrate. Then on the actual day (yesterday) she had ‘Cake in the Park’ with her pre-school friends. 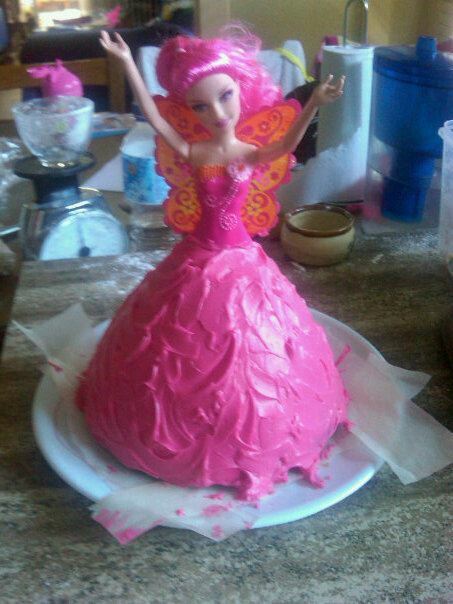 And on Sunday she’s having a fairy birthday party. Anyway, I decided to use yesterday as the practice run for my Fairy Princess Cake. 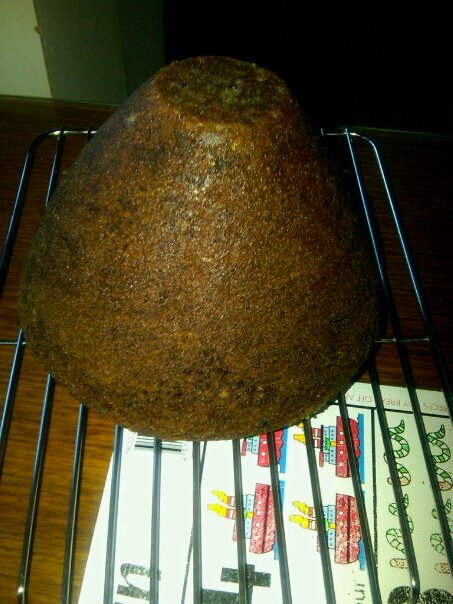 I spent quite a bit of time researching this – recipes, cake tins (Dolly Varten) and decorating options. I will post the recipe below, but first I wanted to show you the many stages of the cake decorating that went on early yesterday morning! 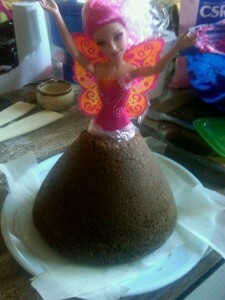 Stage 2: Stick fairy Barbie into the cake (and also line the plate). Note: I’m afraid some of Barbie’s legs had to go. I know…cruelty to dolls is NOT a good sign! But it was off at the knees for this Fairy Barbie. 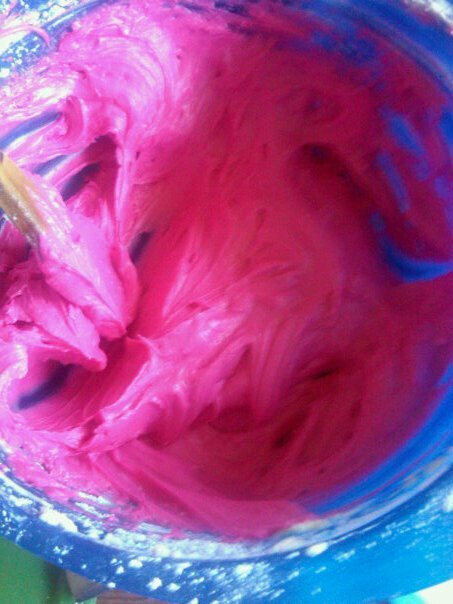 Stage 3: Pink cream cheese icing. Stage 4: Fairy Barbie’s dress is iced! Stage 6: Take a step back and bask in the glory. Especially when your husband laughed – loudly – when you first told him of the task at hand and showed him photos you were aiming to replicate! Cream the butter and sugar. Add egg and beat well. 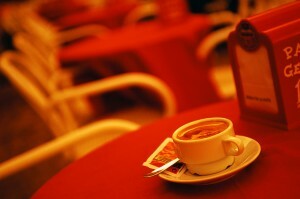 Dissolve soda in warm milk and mix in. Add mashed bananas. Lastly, fold in the flour and baking powder. 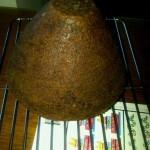 Bake (45 mins) in a moderate oven (180C). I doubled the recipe and cooking time for the Dolly Varten tin.